Meghan & Hunter... where do I even begin!? These two love birds work together, but didn't connect until they were matched online. Shortly thereafter, it was clear to both of them why. And, after hanging out with the two of them in the rain, it's pretty clear to me as well. For many couples, my "I think we might miss the rain" email that I sent them yesterday afternoon before their engagement session might have given them pause and consider rescheduling. But Meghan & Hunter's response was simply that they wouldn't melt. My kind of couple! I first met Jen & Mike at Danielle & Dustin's wedding last fall. Danielle had told me that her brother was engaged to Jen and I will admit that I was secretively hoping that they would consider me for their own wedding. It goes without saying that I was super excited when Jen reached out and asked me if I would be able to travel to Connecticut in 2019. Then we shared a laugh over the idea that traveling to Connecticut would take just as long as traveling to many places here in Maine. Of course I travel! As we were planning their engagement session, I suggested Wells National Estuarine Research Reserve so that they could take in some of Maine's coastal beauty in a location that was also environmentally minded, much like the two of them. From the views from the hill tops to the pathways through the woods, the boardwalks among the ferns and then the views over the marshlands, we had an awesome time exploring the Reserve and chatting about their plans for their fast approaching wedding. Truth be told, I might have pulled a few lovely ticks off me, but I dare say they were worth it for the images we were able to capture together. I cannot wait for their wedding next year! Jen & Mike, thank you for trusting me to capture this chapter of your life together. What a blast! Rainy? What rain? No rain for Samantha & Dalton! No rain. No snow. No Wessie sightings. That pretty much sums up Samantha & Dalton's engagement portraits last week at Riverbank Park in Westbrook, Maine. When they first booked me at the beginning of the month, they had their fingers crossed for fresh snow for their engagement portraits. Flash forward to last week. We had been clobbered by a few rounds of snow storms. And then Mother Nature pulled a 180 and proceeded to melt a great deal of it with a heat wave. Yet the snow in Westbrook held on for us and gave them a (relatively) clean blanket of snow. When Molly first contacted me about her September 2017 wedding with Colin back in August, I instantly knew that I really wanted to be their photographer. We emailed back and forth about their incredible plans at one of my favorite venues in Maine and also about their relationship over all these years that led them to this point. We chatted on the phone shortly before they left for a trip to Iceland and it was like talking to old friends. Have you ever had one of those days that makes you look around for Murphy to see where that Law wand of his is waving? For Ashley & Luke and myself last night, I dare say that was the case! After a week with bright sun, warm temperatures, and generally summer weather, Mother Nature threw us a curve ball last night for their engagement portraits in Ogunquit's Perkins Cove. With an eye to the sky and dark clouds forming, I managed to catch just enough data connection on my phone to tell that rain was coming near and, from the looks of it, it was going to get wet. Sure enough, a bright red blip appeared inshore of us and we were in the direct path. This is where being prepared for anything comes in handy. A quick jog to my car to grab a few of my umbrellas and these two love birds hit Marginal Way with me for a wet walk along the water. Despite offers of $100 for their umbrella from those who were walking by and getting drenched, Ashley & Luke cuddled up and stayed (mostly) dry. Putting up with the storm gave us the most amazing light after the clouds. Gazing out to sea, the horizon and the sky seemed to blend together as if they went on forever. The sun just peeked out enough from the clouds to give us a smidge of warmth. And we were able to tuck those umbrellas away for another day. And that won't be their wedding in 2017 because we've had our fill of rain when it comes to their nuptials. Hey, if it has to rain, let it be during your engagement portraits. Ashley & Luke, I am so very happy to be a part of this chapter of your life together and am glad that our paths crossed a few years ago to lead us to now. Alan and I can't wait for your wedding next summer! Thank you, Jen, for being our matchmaker! Where has the past year gone? That is pretty much my reaction when my couples' wedding days come a year after they first contacted me. For Katie & TJ, that is certainly the case. We spent a few weeks conversing over email before finally meeting face to face last August at SoMe Brewing Co. in York, Maine. Shortly thereafter, they made my day by telling me that Alan and I were their pick for their wedding photographers. Yipee! Fast forward to this past weekend after several rescheduled engagement session dates thanks to poor weather conditions. And, thankfully, Mother Nature kept the curve ball to herself this time and gave us awesome conditions for wandering around the Old Port in Portland, Maine, together while catching up on all of the awesome things they have planned for their wedding in the city later this month. I'd like to think that I had a hand in the weather working out since I opted to wear my big rain boots just in case of rain and wound up only needing them for my puddle hoping. I think what stands out to me the most about Katie & TJ is simply their ability to make each other laugh and smile. A lot! Sometimes it was all I could do to keep my camera up while chuckling at their antics. Hearing about their secret plans for their wedding at the end of the month also made me even more excited for their big day (as if that was really possible in the first place). Katie & TJ, we are so excited to see you both again in just a few short weeks! Enjoy every minute leading up to the big day. We'll see you soon! This seemed like a good idea at the time. Bowser & Bruin. Oh, boys. When my couples ask me if they can bring along their furry babies to their shoots, I always say yes. I love me some furry snuggles! For Cairsten & Jimmy, my response was no different. After building a relationship with them ever since Kelly & Ryan's wedding, I could not wait to meet their two pups, Bowser & Bruin. We opted for Bug Light in South Portland for the views of the Portland's Old Port, the harbor, the lighthouse... the list is endless. It is a great area with lots of variety AND it's pup friendly! Bowser & Bruin did not disappoint. They were super excited about everything. Wanted to meet everyone. Photos, what photos? We're here to PLAY! Meandering around the park with Mutt & Jeff in tow was an experiment in hilarity. When they weren't in the photo, we had them tied to a bench or I was holding their leashes to give Cairsten & Jimmy a break from the chaos. I'm sure they were both thinking "This seemed like a good idea at the time." Yet, when it gets down to it, even with the chaos... the furry friends in our lives are an integral part of our lives. Yes, they bring chaos. But they also bring lots of kisses, laughs, and uninhibited love. And, as part of your family, it is worth the chaos for shots like this one. I am still brought to laughs every time I see Cairsten & Jimmy post photos of their pups on Facebook. Thank you for hanging out with me boys and letting me tell your parent's love story. You are lucky boys to have such awesome people to call your own. Many of my couples find me through a "matchmaker". For Sarah & Sam, their matchmaker was Kristan, but their circle of friends that I've had the fortune of working with is one of the most extensive I've ever had. I love it when that happens so serendipitously! Knowing even a few of their connections to me before we formally met, I knew that they would be awesome to work with. And boy was I right! Yesterday we met for the first time in real life (thank you to Google Hangouts for providing our virtual meetings before now!) at one of my favorite spots in the greater Portland area. Two Lights State Park in Cape Elizabeth is an awesome location simply because of the wide variety of scenery that you have in one spot. Sarah & Sam are both big fans of Maine's rocky coastline, which instantly made me suggest that we meet there. The sunsets from that part of Cape Elizabeth are also pretty spectacular! As we explored the Park together, I loved learning more about the two of them and their plans for their 2016 wedding while sharing lots stories and laughs. What struck me the most during our walk was how naturally perfect for each other they are. Sam looks at Sarah and he just cannot help but beam this giant smile that you only see when they are this in love. And Sarah is such a natural beauty who perfectly fits with Sam with no prompting needed. They are just... perfect for each other. I know it seems cliche, but they really are. We wrapped up our time together by visiting the boardwalks at the nearby Kettle Cove Beach. I love ending our sessions there as it has great views of the sun as it sets over the Maine coastline, which is harder to find from the main land than you might think. For what was potentially going to be a stormy afternoon, Mother Nature kept her act together and gave us the gift of a terrific day together. I cannot wait for their 2016 wedding! Here is a sneak peek from the full gallery that I'm preparing for them from their session. I will admit that it was super hard to select only these six. They are naturals in front of my camera! Here it is. The last official day of summer. And I'm reaching for a blanket to warm up with the very fall like temperatures we are experiencing today in Maine. What better way to ring in fall than to look back at Michelle & Jory's engagement portraits from last fall? And, with their wedding coming up this weekend (YIKES! ), I couldn't help buy reminisce. That day was the most perfect fall day. A slight crisp to the air. The leaves were starting to turn from green to reds and oranges and fall from the trees. It was, in every way, awesome. Michelle & Jory's story is one that I'll always remember. They met behind bars. No, not as inmates! As coworkers. Michelle was a nurse and Jory a corrections officer. And when the story of how a couple met is THAT good, you can't help but never forget it. I have had such a blast getting to know both of them since Michelle first contacted me in September of 2014. From our initial coffee date when we realized we were at different Dunkin' Donuts right down the street from each other to their engagement portraits and then seeing the wedding planning and bridal shower festivities through our connection on Facebook. When I see Michelle & Jory on Saturday, it won't be as my clients. I'll be there to captures my friends getting married. And I can't wait to see it all as we come full circle to this day. Congratulations, Michelle & Jory! Enjoy these last few days and get ready to have an amazing day this weekend. We can't wait to see you two! Erica first contacted me about photographing her wedding way back in April of 2014 as they were starting their wedding planning. After six years of courtship, it was time for them to make it official! With a love of the great outdoors and Maine itself, like me, we made a connection fairly quickly. As they officially booked me to photograph their Maine wedding, we set to work on planning their engagement session. For a juxtaposition to their wedding venue (you'll know where after this weekend), we went to the coast and opted for the quintessential coastal village of Perkins Cove in Ogunquit for their sunset portrait session. Looking back on their session, it is hard for me to chose what I loved the most. Having never been to Perkins Cove, I was struck by just how picturesque the area itself was. The fishing boats and dinghys in the harbor. The smell of the sea in the air (yes, that fish smell, too). The shingled siding of the storefronts and homes. And then the cute little spots tucked away in obscure corners. But then there was Erica & Micheael. Erica navigated the village walkways in awesome, sky high heels with such perfection (and, goodness, does she have awesome shoes). Her outfits were perfectly matched to the seaside town. Meanwhile, Micheael doted on Erica so much that it was easy to see why they were together. Planning a wedding was a natural fit for these two. And, boy, are they naturals in front of my camera. As the sun went down that night, they left to celebrate Erica's birthday. And now, just over a year later, we're getting ready to celebrate their marriage. I cannot wait to see the two of them (and their family & friends) this Saturday. It's certainly going to be an awesome day! 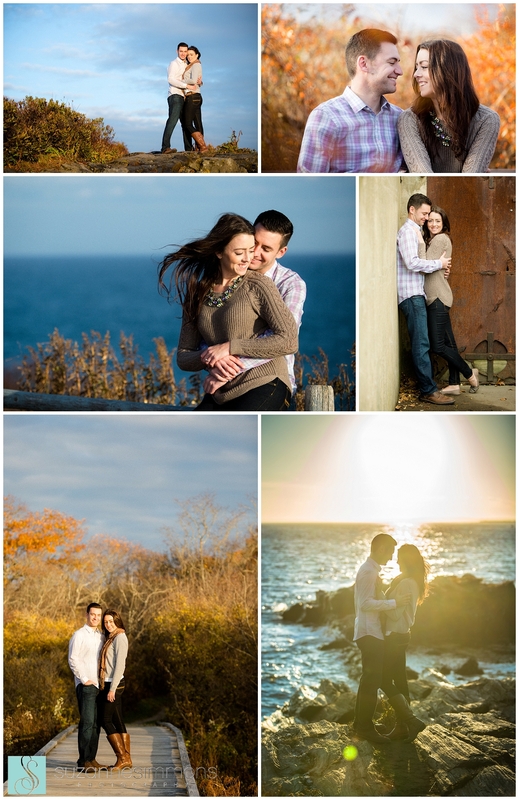 Here is a look back at some of my favorite images from their engagement session in Perkins Cove. Stay tuned to see their wedding sneak peek! You surely won't want to miss it. With less than a day to go before Kelly & Kevin get married (YIKES! ), I wanted to take a look back at their engagement portraits we took in October 2014. We planned their session to coincide with the foliage and Mother Nature awarded up for a gorgeous day for exploring downtown Portsmouth, New Hampshire. Kelly & Kevin are lucky enough to call the area home, so they wanted to be sure that their engagement photos represented that aspect of their life together. From visiting Prescott Park with a super adorable picnic basket and blanket to the steeple of the North Church, we certainly captured what makes Portsmouth so awesome (and made me question why I don't spend more time there myself!). With the city covered, we took off to Great Island Common in New Castle, New Hampshire, in search of foliage and the amazing coastline. We certainly hit it out of the park with both! Watching the sunset behind the trees made for the most gorgeous light ever. Add in the ocean breeze to blow Kelly's hair around a bit and it was the perfect way to wrap up the day. I cannot believe how fast the past year has flown by since you first contacted me, Kelly & Kevin. I am so excited to see you both on Saturday! Funny. Warm hearted. Youthful. Meant to be. It seems like just yesterday I first met them for their engagement portraits at Two Lights State Park in Cape Elizabeth. Planning "from away", as many of my couples do, often means that our relationship before their engagement session is through video chats, phone calls, and emails. Meeting Sara & Jason for the first time was instantly natural. Seeing them together was being able to see what was meant to be. Their collective love of life, ability to find humor in everything, the way they make each other laugh... it's all just perfect. Tomorrow, when they tie the knot overlooking the ocean, they will be making that connect as official as it can be. And I can't wait to celebrate with them! Here is a look back at their engagement portraits that we captured at the State Park and at Kettle Beach in Cape Elizabeth almost exactly one year ago. Congratulations, Sara & Jason! We can't wait to see you both tomorrow. It was a year ago today that I met Mallery & Matt at one of my favorite portrait spots in the greater Portland area: Two Lights State Park. Two Lights is awesome because it offers a wide variety of scenery all within one spot. As State Park Pass Holders, it is certainly one of our favorite ones to visit every year. It's so darn pretty! And, when you add in lovebirds like Mallery & Matt, you just can't go wrong! From Mallery's stunning eyes to the way Matt was stuck to her like a bee to honey... they were just so sweet together. We had a great time exploring the Park before going to Kettle Cove to catch the sunset on the beach. It was the perfect way to end the day. Mallery & Matt, congratulations on your wedding this past May! I can't believe how fast the year has gone by. Keep basking in the newlywed glow! Here it is. The night before Cairsten & James tie the knot and get hitched! 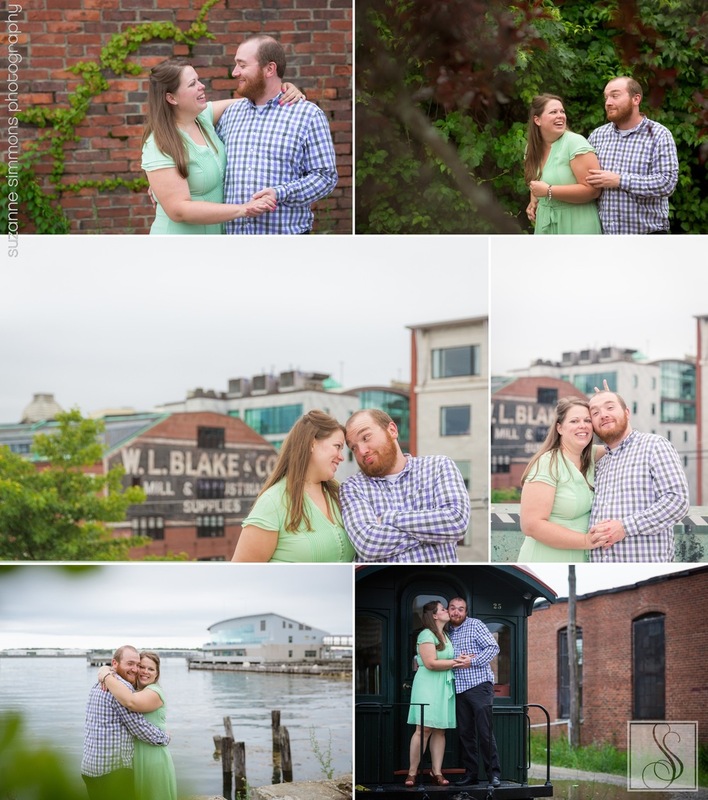 I instinctively thought back to their engagement session at Bug Light in South Portland, Maine, just shy of a year ago. I'll be honest. We started off with some good laughs just finding each other despite having met before! (Bug Light, just so you know, is not the one by the Southern Maine Community College Campus.) Then I finally got to meet their two exuberant dogs and, well, there was more laughter. Wrangling those two is certainly a workout! Fortunately, the actual weather that day turned in our favor with bright blue skies and boy was it warm. That didn't mean that Sara didn't rock her super cute pink Hunter rain boots though! We had such a great time wandering around O'Donal's Nursery on the Gorham town line in Scarborough. Colin's family has a long time connection to the Nursery and I love it when the location holds a deeper meaning for my couples. Here is a look back at their engagement session from May 2014. Alan and I cannot wait to celebrate with them tomorrow as they tie the knot at Damariscotta River Association's Round Top Barn! Be sure to check back to see photos from the day. It's sure to be amazing!